Greece, China, Russia. ISIS. Cyber security. North Korea. Oil Prices. Stock market valuations. The Fed’s interest rate policy. Open any newspaper and it’s hard to choose which headline will be the first to knock stocks back into the red and blow up your portfolio along the way. What is the biggest threat to your portfolio today? Blogger and financial advisor Joshua M. Brown says that the biggest threat to your portfolio isn’t any of these news headlines – it’s you. China is not threatening your portfolio, nor is the price of oil or the level of the Fed Funds rate. What’s threatening your portfolio is the way in which you may react to any of these items, plain and simple. Your emotions and the actions you take during times of increased volatility or drawdown will ultimately have more impact on your long-term returns than any exogenous thing that may come along. Mr. Brown points out that in 1929, 1987, 2000, and 2007 no one was able to predict a stock market collapse – nor can we look back today even with all the benefit of hindsight and point to one single event that precipitated an entire crash. 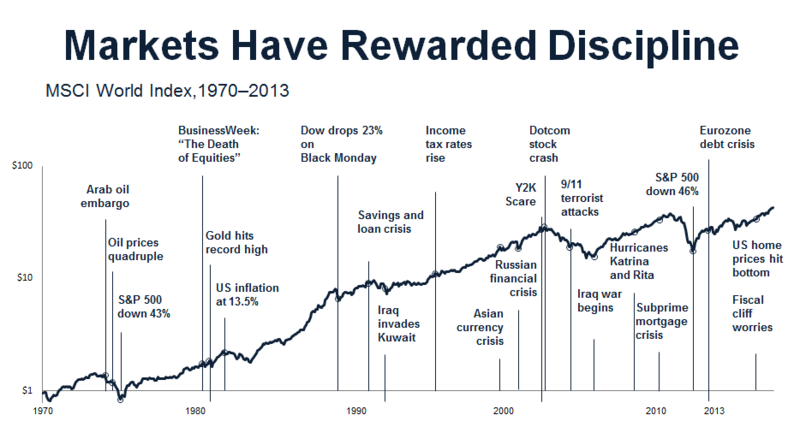 He goes on to say that it makes “more sense to recognize the durability of the capital markets in the face of all these threats rather than try to play hopscotch with our retirement assets each time a new one arises,” capping his point with the chart below (courtesy of Dimensional Fund Advisors). I raise the above topic – not as any sort of market commentary on whether the bull market still has legs in it or if the market’s due for a precipitous decline – but to point out a common mistake that many investors make: allowing others (whether it’s the media, friends, co-workers, or even clients) to constantly influence their buy and sell decisions. Keep this in mind and you might just save yourself from your own worst enemy.